The 5 largest U.S investment banks pocketed almost $27 billion in total advisory and underwriting fees in 2016 – a little over 32% of the total figure for the industry. 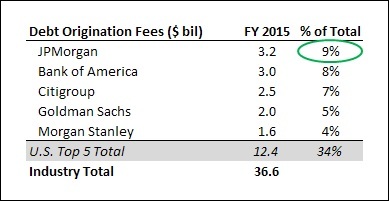 The chart below captures the total investment banking fees reported by the five largest U.S. investment banks since 2012. The green-to-red shading for figures along a row show the variations in these revenues for a particular bank over this period. Notably, these five banks capture ~33% of all global investment banking fees in any given year. Total fees were considerably elevated in 2014 and 2015 thanks to strong M&A activity accompanied by a jump in equity underwriting activity. Equity underwriting fell considerably in 2016 around the globe, and although this was mitigated to an extent by an increase in Chinese debt origination fees, the largest U.S. banks saw their market share shrink due to their weaker presence in China. From being the largest player globally in terms of total advisory and underwriting fees prior to the economic downturn of 2008, Citigroup has steadily seen its market share fall to the fifth position among the U.S. banks over the years. This was because Citigroup’s debilitating losses from its investment banking activities (especially from debt origination) during the downturn forced the bank to slash its presence in the industry. That said, Citigroup remains a significant player in key emerging economies, where the bank has been able to leverage its local retail banking presence to compete better with its peers as well as local competitors. What Was The Market Share Of The Largest U.S. Banks In Global Equity Capital Markets For Q4 and FY 2016? How Have Equity Underwriting Deals Closed By U.S. Investment Banks Trended In The Last 5 Quarters?